The Empire Exhibition by Rone, an internationally renowned street artist based in Melbourne, is set amongst the decaying glory of art deco mansion Burnham Beeches. For the past 20 years, the grand country hills home of the Nicholas family (of the Aspro dynasty) has sat empty, waiting. Contemporary artist Rone has spent the last year transforming this abandoned mansion, taking on the house that was already slowly but surely falling apart with open arms. Instead of giving the house a fresh new coat of paint, Rone built on the space, working with a crew of stylists to include carefully placed props, furniture, lighting, soundscapes and even custom scents to turn each room and the overall house into a dreamlike time capsule. On Tuesday 26 March, the Year 11 VCE Art and IB Visual Arts classes were lucky enough to view the exhibition. We marvelled at Rone’s work, with at least one wall in every room featuring a large-scale portrait of a woman’s face. They are each painted from different angles and featuring different facial expressions. Rone made sure that each room co-ordinated together by paying attention to the smallest details such as, on one side of the house, the woman’s eyes are open and the other side, they are closed. This and other small but crucial details made the twelve transformed spaces come together as one ode to a lost past. 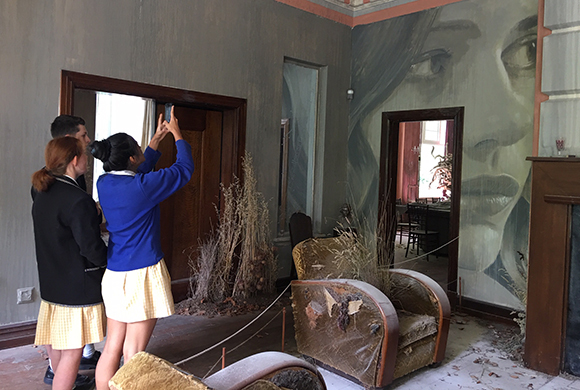 This unforgettable experience at Burnham Beeches left the Year 11 Art students thoroughly mesmerised and inspired, as both VCE and IB students will be embarking on their own paintings at the start of Term 2.